The Interior Board of Land Appeals refused to excuse Taylor Energy Co. from requirements to permanently plug oil wells that could be the source of the leak. The board’s Oct. 30 decision wasn’t made public until Tuesday. One week before the board ruled, the Coast Guard ordered the New Orleans-based company to design and install a new containment system to capture and remove leaking oil until a permanent solution can be developed. The company faces daily civil penalties of up to $40,000 if it fails to comply with the agency’s Oct. 23 order. Federal regulators haven’t ordered Taylor Energy to resume a long-dormant drilling operation to plug a cluster of wells at the site where a company-owned drilling platform toppled during Hurricane Ivan in 2004. But that remains an option now that the Arlington, Virginia-based appeals board has upheld a May 2015 decision by the Interior Department’s Bureau of Safety and Environmental Enforcement. The bureau concluded Taylor Energy may need to do more drilling work to end the leak. Government lawyers recently disclosed a new estimate that approximately 10,500 to 29,400 gallons (39,747 to 111,291 liters) of oil is leaking daily from the site where slicks often stretch for miles off Louisiana’s coast. That’s much higher than previous government estimates and dwarfs the company’s own assessment of the leak’s volume. 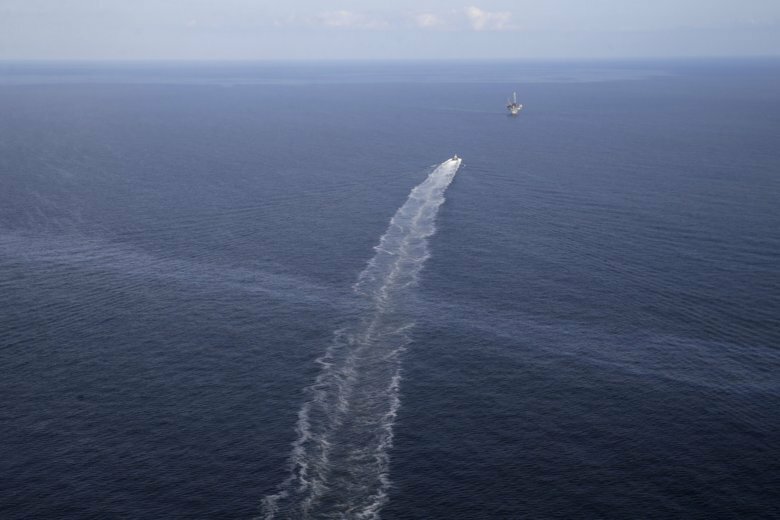 Oil has been leaking from the site since waves whipped up by Hurricane Ivan triggered an underwater mudslide that wrecked Taylor Energy’s platform. The mudslide also buried a cluster of wells under mounds of treacherous sediment, preventing the company from employing traditional techniques to plug them. The company, however, has insisted there is no evidence any wells are still leaking. It claims residual oil is oozing from sediment on the seafloor. And, in a court filing several years ago, Taylor Energy said experts concluded in 2014 that the sheens contained an average volume of less than 4 gallons per day. But a 2015 investigation by The Associated Press revealed evidence that the leak is worse than the company, or government, had publicly reported during their secretive response. Presented with AP’s findings that year, the Coast Guard provided a new leak estimate that was about 20 times larger than the company’s estimate. In 2015, the Bureau of Safety and Environmental Enforcement refused to grant Taylor Energy a “departure” from regulations requiring it to permanently plug the 16 remaining wells. The company also asked for permission to leave contaminated sediments in place at the leak site, but the bureau also rejected that request. “If there were anything legally permissible and effective that Taylor Energy could do in an environmentally responsible manner to stop the sheen, we would have already done it,” the statement adds. Administrative Judge James Jackson, who wrote the Interior Board of Land Appeals’ decision, said the board knows about the environmental risks of more drilling work. “However, we disagree with Taylor’s view that this issue has been decided, once and for all, because estimated environmental costs currently outweigh anticipated environmental benefits,” Jackson wrote. Taylor Energy sued the federal government in 2016 to recover millions of dollars it set aside for leak-related work, including the drilling operations. The suit claims regulators violated a 2008 agreement requiring the company to deposit approximately $666 million in a trust to pay for leak response work. The company argued the government must return the remaining $432 million. During a hearing in Washington on Sept. 27, the government asked a federal judge to dismiss the company’s suit. The judge hasn’t ruled on that request yet.